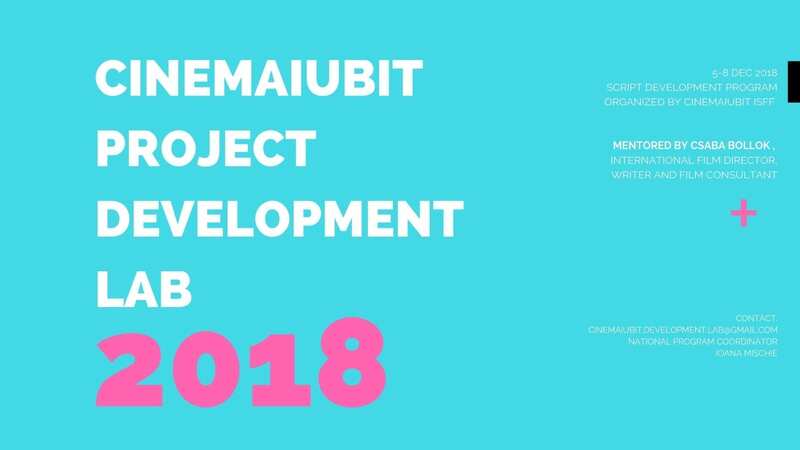 CineMAiubit Project Development Lab 2018 kicked off its first rebranded edition and its seventh edition of international script development based in Bucharest, Romania and announced this year’s selected projects, which is one of the most diverse mix of stories and cinematic voices up to date. All the projects will enter an intensive script development marathon through an introductory storytelling workshop and one-to-one meetings lead by international guest Csaba Bollok, outstanding Hungarian writer/director and script development trainer of Midpoint Central European Script Center. Hosted by CineMAiubit ISFF, the lab aims to empower junior storytellers to improve their film craft and make it appealing on an international level. The lab is nationally coordinated by Ioana Mischie and designed as an inspirational playground for early stage career filmmakers, reuniting mostly students or fresh Alumni currently based in Romania. This year’s edition has Emil Vasilache as a production intern. The participation is free of charge for all the selected participants. CineMAiubit Project Development Lab began as the first international script development program in Romania back in 2012 (under the nickname of miniMIDPOINT) and ever since then it helped develop more than 25 script projects often led by teams of writers-directors-producers. Numerous short film projects were finalized, reaching excellent national and international results, such as: “Tomorrow, Bach” (directed by Mihnea Ciorica, written by Diana Voinea) nominated for the Gopo Awards 2014 – Best Short Film or “In The Sidecar” (written by Ion Bordian and Mircea Bobina, directed by Mircea Bobina), selected at numerous international festivals worldwide. Csaba Bollok is an outstanding, mesmerizing voice in the contemporary Hungarian cinema. He started making short movies as an independent filmmaker in the late 80s and graduated as a film director at the Hungarian Film Academy in 1994. He also studied filmmaking several times in the United States, and made some shorts at the legendary Béla Balázs Studió. His first feature North by North (1999) was awarded the Hungarian Filmcritics’ Prize. Iska’s Journey (2007) won Grand Prize at the Hungarian Film Week, premiered internationally at the Berlinale, and has been a great international success since then. At present, Csaba Bollók is a professor at the Eszterházy Károly College, Moving Image Department. Ioana Mischie is a Romanian-born transmedia cinematic storyteller (screenwriter/director), awarded for filmmaking, creative writing, interactive concepts and a Fulbright Grantee Alumna of USC School of Cinematic Arts. Her cinematic projects as writer/director have traveled to more than 70 festivals worldwide (Palm Springs ISFF, Hamptons IFF, Thessaloniki IFF) and were developed in international programs (Berlinale Talents, Sundance Workshop – Italy, Cannes International Screenwriters Pavilion). She has collaborated as a writer/director with Channel 4 in the UK (for two doc webseries with a record of views in the UK) and with the Oscars awarded Legende Films (for the short fiction “237 Years”). Cofounder and Head of Storyscapes, an NGO focussing on transmedia storytelling initiated in 2012. Envisioning the world as a neocreative playground, she deeply believes that storytellers are the “architects of the future” (Buckminster Fuller).